Summary: Nazotoki Live ('Mystery Solving Live') is a program where both viewers and studio guest are challenged to solve a murder mystery live. A murder mystery drama is occassionally interrupted by questions aimed at the studio guests and viewers back home, that serve as a hint to identifying who the murderer is. The program is broadcast on two consecutive nights. Gyakuten Saiban (Ace Attorney) series creator Takumi Shū was one of the three studio guest of the episode broadcast in January, 2016. The interview translated below was held between him and mystery writer Ayatsuji Yukito, who wrote the episode. The discussion also touches lightly on the creation process of both writers. "Are you going to watch while you solve it yourself, of watch people solve it?" 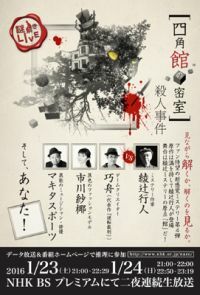 Nazotoki Live ('Mystery Solving Live') brings you a double-layered experience, where you watch a drama based on an original plot by a mystery writer, and studio guests try solve that mystery too. The person who wrote the fourth episode of the show, Shikakukan no Misshitsu ('The Locked Room in the Square House'), is that forerunner of the shin honkaku (new orthodox) movement, Ayatsuji Yukito. And the one who will take on the challenge of solving the mystery in the studio is game creator Takumi Shū. A heated discussion before the live recording of the show! Let’s hear from these two who have made many hit mystery fiction in the past about the secret behind creating mystery tricks and more! Interviewer: Mr. Ayatsuji, you were a studio guest for the second episode of Nazotoki Live. How was that? Ayatsuji: The second episode, Shinobi no Sato Satsujin Jiken ('The Shinobi Village Murder Case'), was written by Yutaka Maya and was asked because they wanted to see a confrontation between a senior and junior member of the Kyoto University Mystery Club. And well, there was definitely pressure weighing down on me (laugh). I have some experience with appearing on TV before, but that was going to be a live broadcast and I had never been on the screen for so long, so that was already a lot of weight on its own, and solving the mystery was also quite difficult. Even if I’m a senior member, he sure didn’t go easy. Takumi: Did you try getting something of Mr. Maya, as his senior? Ayatsuji: Even I did, he wouldn’t give! But no, that would have been unfair. I still remember it. The feeling of regret when at the end of the first night, I had no choice but to admit defeat… (wry smile). But that has become a funny anecdote now. But anyway, two days of live broadcast, one after another, is quite harsh. Takumi: Hearing this, the pressure weighing down on me keeps building more and more (laugh). Takumi: I had recorded the second and third episode, so I have played along too. I actually solved quite a great of the mysteries, but only by watching the show over and over several times. With the second episode, I overlooked a big clue that pointed to the culprit, so I got it wrong there. There was a segment in the processo of solving the mystery in that episode I will never forget. I was listening to the detective explaining his deductions, when he suddenly asked me (the viewer): “Well, what is the logical conclusion you can make based on this? I had no idea…. Takumi: That was the end of the last night (wry smile)…. That was a nasty, well, mean problem. Takumi: Yes. I got stuck there. I was watching it and thought: “Mr. Ayatsuji is having it difficult now”, but the second night, your deductions were a lot sharper and I was really surprised. As expected from someone like you. Ayatsuji: I thought about it all night. I couldn’t get it out of my mind and couldn’t fall asleep. Even after I fell asleep, I saw dreams of me raising my hands in defeat (laugh). But they keep posting new clues on the official website, so I’d sleep a little, and then get up and check the official website, again and again. As for the third episode, Bihakujima Satsujin Jiken ('The Bihaku Island Murder Case'), I was actually participating with the meetings on it from the planning stage on, so I watched that knowing what it would be about. It was an episode like you’d expect from Mr. Abiko. A work as expected from the creator of the game Kamaitachi no Yoru (Banshee's Last Cry). Interviewer: Both of you have used many tricks in novels and games, but how do you come up with those ideas? Ayatsuji: It depends on the work. Sometimes I first come up with a trick, somethings I come up with a name for a house or a situation and then think of a trick. For Tokeikan no Satsujin ('The Clock House Murders') I had no ideas for any tricks whatsoever. I just decided I wanted the next novel to be about “The Clock House” and started thinking from there. For Kimenkan no Satsujin ('The Strange Masks House Murders'), I first came up with the situation where everybody would be wearing masks. Takumi: I might be a game creator, but I’m just a white-collar worker, so I usually think of tricks during work hours. We have schedules, so if it says “Today is Trick Day”, I have to wring something out of me then. I’m just a company employee (laugh). Ayatsuji: So if I’m in a pinch, I can just order one from you, right? “One trick by this and this date, for this price” (laugh) I often suddenly hit upon an idea when I’m in bath, or taking a stroll, or just relaxing, rather than when I’m thinking behind my desk. I might be watching a movie or playing a game, when some vague image suddenly appears in front of me…. Takumi: So you’re always looking for something in your head. It never goes to off-mode. Ayatsuji: My head has no off-mode, but I don’t think it has an on-mode either (laugh). To be honest, I don’t accept job requests, unless I can think of some idea. At first I tried to back out of from the offer from Nazotoki Live this time, but then I thought of an idea and decided to take the offer. But even if we’re talking about solving mysteries, it’s different for books and games. In books, the story will continue whether the reader solves the mystery or not, but in games the story will never reach a conclusion if the player doesn’t solve the mystery. Takumi: Precisely. I make the Gyakuten Saiban (Ace Attorney) game series, which has trials as its theme, but games have one important premise: “the player is the one who solves the mystery”. Also, games are structured to have a constant stream of small mysteries in relatively short spans of time, which you solve one by one, so I pay attention to when things appear in the story and how clues are presented. That’s why a “trial” is a setting that is very well suited for games. When a prosecutor is the opponent, they need to keep information hidden for the player for strategic reasons. Interviewer: What are your feelings about the upcoming episode of Nazotoki Live, as the person who created the mystery and the person who will solve it? Ayatsuji: Mr. Abiko came with Abiko-esque plot, that was very game-like. Mr. Maya too came with a Maya-esque plot, that had an acrobatic display of logic at its center. So I thought I had to do something “like me”. So that’s why it became the "Square House" (laugh). So I think it’s become an Ayatsuji-esque work. Mr. Takumi created the Gyakuten Saiban games, and is well-versed in mystery fiction, so I fear he might be a strong opponent. Takumi: Not at all… They ofen say that “making and solving are not the same”, and like the saying, I’m actually fairly bad at solving myself (laugh). The tricks of the second and third episode really showed off each of the writers’ specialties, so I’m really looking forward to see what’s next. I’ve been reading Mr. Ayatsuji’s books ever since university and his works usually follow one of these two big patterns: they can be solved either by logic, or there is some trick that turns everything upside down at the end of everything. But which of these will it be this time…? Ayatsuji: Which of them could it be? (laugh) But it might actually be too easy for you. You might see through it within a second.